Given the tempestuous climate of the market this week, there are most certainly deals to be had. Here are a few of the Stock Rover staff’s favorite stocks this month. All of the stocks can be found in the “Stocks on Sale” watchlist, available in our Library (instructions here). Note that these stocks range in terms of their growth/riskiness profile. Always do your own research to ensure that a stock meets your personal investing standards. Here are the 14 stocks, ranked by the “Bargain Hunters” ranked screener (also recently added to the Library), which emphasizes value (earnings yield and PEG) and growth (increases in sales, EPS, and operating income). 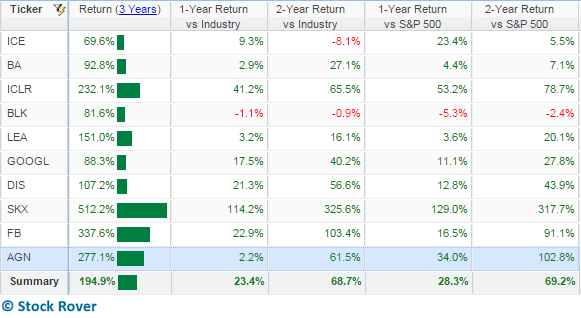 On top of all that, Healthcare has been the best-performing sector of late. Potential downsides to GILD? It’s biotech, which means by nature it’s a riskier company than something in, say, consumer defensive. It has a debt/equity of 0.8, which is somewhat high, especially with the prospect of rising interest rates, and it scores a D from Morningstar for its financial health compared to its sector (it gets a B for financial health overall). But on the whole, we think the company is clearly well run and poised for growth. Perhaps you’ve heard of it? Apple continues to be an attractive investment. With its valuation at a relative low, it could be a good time to enter a position on the world’s largest company. 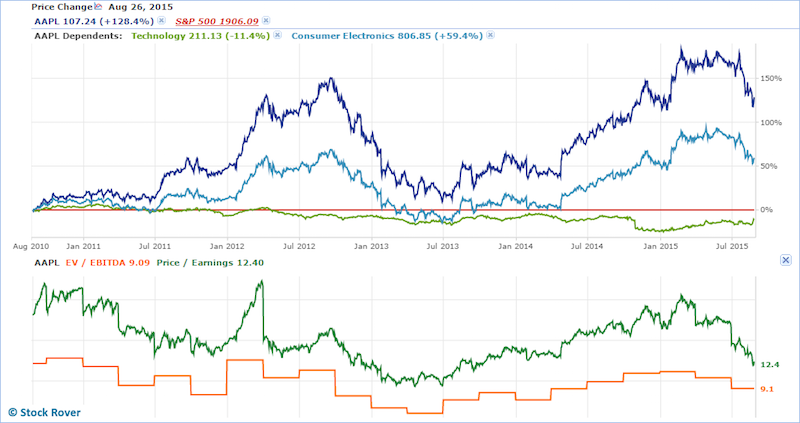 Take a look at its outperformance of its sector and industry, as well as its P/E and EV/EBITDA over the past 5 years. In the top chart, all values are relative to the S&P 500 (red), which is set as a baseline. Despite its massive size, the company continues to grow its earnings and sales, often with rates in the double digits, and it maintains excellent capital efficiency. It must be mentioned, however, that Apple is highly dependent on Chinese sales and manufacturing, which is concerning because of the volatile economic climate in China right now. Tim Cook recently responded to those concerns, essentially waving them off. So, decide for yourself if you want to take a bite of Apple. We think it is still a healthy choice. Mid cap JetBlue was recently featured on our blog as one of our 5 favorite airlines. The stock has a PEG Forward of 0.2, putting it in the 99th percentile. Its P/E multiple of 16.3 is higher than the industry average of 12.2, but, as indicated by its insanely low PEG, is actually quite low considering the strong earnings growth that is expected from the company over the next 5 years. 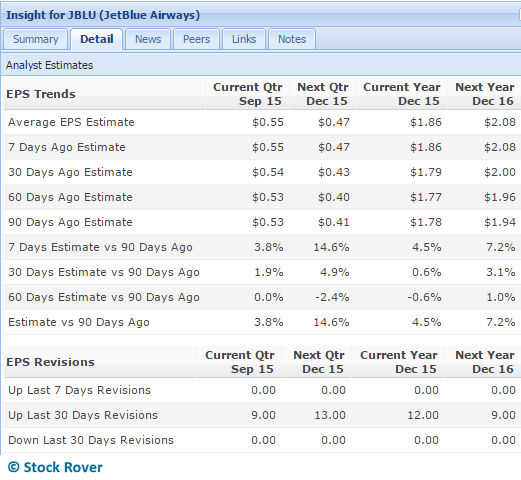 We’re also seeing analysts revise their EPS estimates upward (shown below), something we take to be a very good sign. I actually interrupted the writing of this article to buy some JBLU, because I noticed it was below its lower Bollinger Band. A scan of the JBLU analysis articles on Seeking Alpha clearly shows we’re not the only bulls in the room. If you aren’t allergic to the airline industry, check it out and see if you want to join the run. Its balance sheet is not without a few flinches, including an increasing debt/equity ratio, and current and quick ratios that are below ideal levels. However, the company still scores an A for financial health from Morningstar. We give it a thumbs up. Though the other 10 stocks in the watchlist didn’t pass the Bargain Hunters ranked screener, we think they are worth a deeper look in this down market. Here’s a take on why. First, historical performance. The table below illustrates 1-, 2-, and -3 year performance. Notice how a 150% 3-year return looks middling in this crowd. BlackRock (BLK), the largest asset management company in the world, is the only stock that has been weak over the last two years. More on BLK later. A few things to notice in the above table. For one, we’re seeing a lot of positive, often double-digit numbers in the categories of EPS, sales, and operating income growth over the past five years (the three rightmost columns). We are also seeing high earnings growth predictions for this year and next year for every stock in the list. On top of that, analysts have generally been upping their earnings estimates, as illustrated by the predominantly green EPS Revisions column. When you are in Stock Rover, you can hover over a cell in the EPS Revisions column to see a tooltip with more detail. But for now, just seeing lots of green lets us know that analysts have been revising their estimates upward—never a bad sign. Once again, BLK is an exception here, although it performs decently in all other columns. So, the companies are growing, they seem healthy…are they good values? On average, yes, but you’ll see in the table below that it’s a bit of a mixed bag. Only auto parts maker Lear (LEA) passes the fairly strict criterion used in the Bargain Hunters screener of a PEG below 1. In fact, the only reason LEA didn’t pass the screener was because of the missing PEG Trailing datum. It also has low industry deciles (a decile of 1 indicates that the stock is in the top 10% of its industry for that metric) for P/E and Price/Cash Flow. So Lear looks like a classic GARP pick. Finally, a word on BlackRock. While it hasn’t been a showy candidate in the metrics discussed so far, we like BLK on account of several fundamental factors. Briefly, we see it as a well run company with a diversified product mix that puts it in an excellent and fairly safe position in the financial marketplace. Analysts following the company also remark on management’s commitment to returning value to shareholders. We think BLK is an attractive, low-risk pick for anyone who wants to invest in the financial sector. 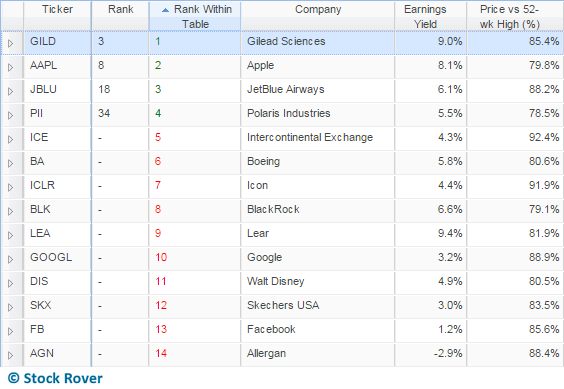 These 14 stocks have captured the Stock Rover staff’s fancy this month, for varying reasons. Get the watchlist for yourself and see if any of them strike a chord with you.